Early Literacy Aside--Explain: Today we're going to highlight narrative skills. This is the ability to describe things and to talk about events and tell stories. Researchers have noted this skill as one of the early literacy skills that will help your child be ready to read. It helps children understand what they will read.Read Clay Boy by Mirra Ginsburg Flannel Board of Three Billy Goats Gruff Early Literacy Aside--Example: In Catch That Goat we're going to say part of the story together. Acting out or repeating parts of stories helps children internalize and understand what is happening in the story. This will help them tell the story back to you, especially with their favorite stories which they like to hear over and over again. OK, now, let's all say together, "Have you seen my goat?" and "No!" Great! 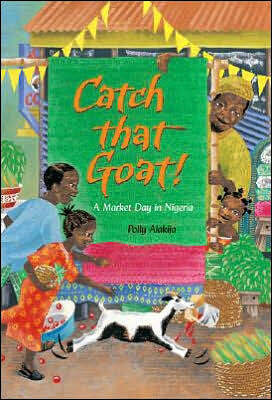 Read Catch That Goat Song: "Spaghetti Legs" on Jim Gill Sings the Sneezing Song and Other Contagious Tunes Rhyme: 1, 2, 3, 4, 5 Once I Caught a Fish Alive Read Oh, Look by Patricia Polacco Early Literacy Aside--Empower: Today we read some of my favorite stories. Practice telling and retelling stories. If you let your child watch television, talk about the shows you watch together. Have them tell you what happened in the show. This will help them talk aout what is happening in books also. Talking about what they know and retelling events and stories helps them understand what is being read. Click below for a storytime plan including the book Eat Your Peas by Kes Gray and highlighting print motivation.